National Archives #80-G-413484. Cropped by author. 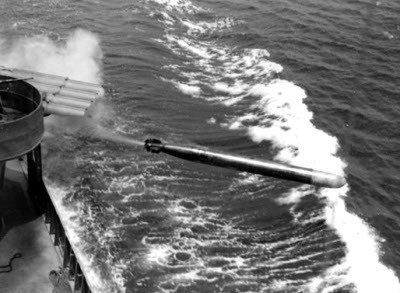 The Mark 15 was the standard destroyer torpedo during the war. It initially suffered from the same detonator problems as the Mark 14: Two destroyers put 16 torpedoes into Hornet in October 1942 but still failed to scuttle her. Its depth control was even worse than the Mark 14, with test shots actually passing under the target nets set up by frustrated destroyermen. Like the Mark 14, it became much more reliable later in the war, but never came close to matching the Long Lance.